and are great starter plants for young or inexperienced growers. lance shaped leaves to tiny heart shaped, moss-like foliage. Pileas occasionally bloom, but their pink or cream colored flowers are very tiny and often go unnoticed. Pileas are only hardy in USDA zones 10-12. They all have the same basic growing requirements. 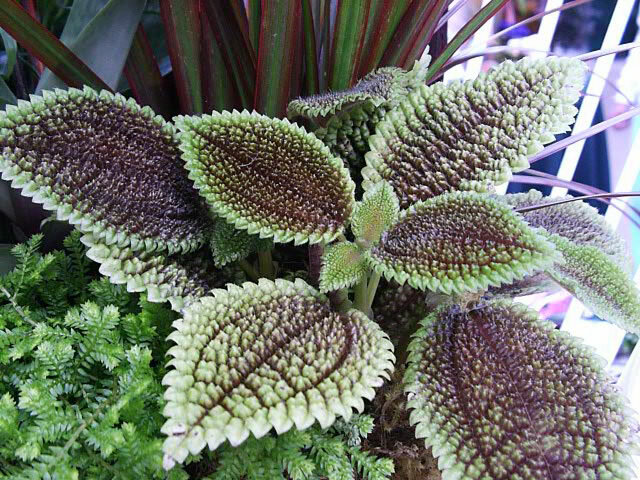 Pilea plants should be grown in bright, indirect light, but never in full sun. They will thrive under fluorescent 'grow lights'. Always keep your Pilea and any other house plants away from heating vents and out of drafts. Pilea plants grow best in warm daytime temperatures of 75°-80° with 10 degrees cooler at night. Pileas need about 50% humidity in order to thrive, so they should be kept on a tray filled with moistened pebbles or misted regularly, or they can be grown in a terrarium. but allow the top inch of soil to dry between waterings when growth slows in the winter. of a liquid house plant type fertilizer with a N-P-K ratio of 3-1-2..
Watch closely for spider mites! Pinch the tips of new growth on branching forms of Pilea to help keep the plant compact. unattractive because their lower leaves naturally drop with age. Luckily, Pilea cuttings root easily, so you can replace your old specimens with fresh new plants every year or two if you'd like. Pileas grow best in smaller, 4" pots or planters where their roots will be somewhat restricted.They should be planted in a peat moss based commercial potting mix with leaf mold and perlite added, or a mix specifically for African Violets. Pileas are very easy to propagate with stem tip cuttings. filled with moistened potting mix. Place the pot in a propagating case or in a sealed plastic bag to hold in humidity. If kept at 75° your new plants will be rooted and growing in 3-5 weeks. 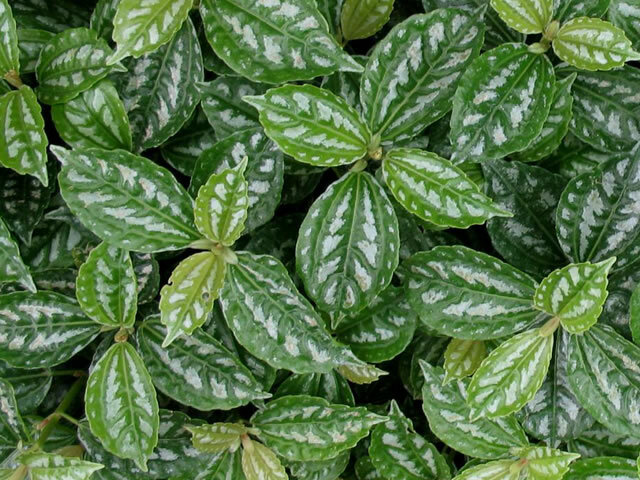 Aluminum Plants are native to Vietnam. They are fast growing, easy to care for plants that branch freely and grow 12"-18" tall. These plants have 3", deep green, lance shaped leaves arranged in pairs along their upright, succulent stems. 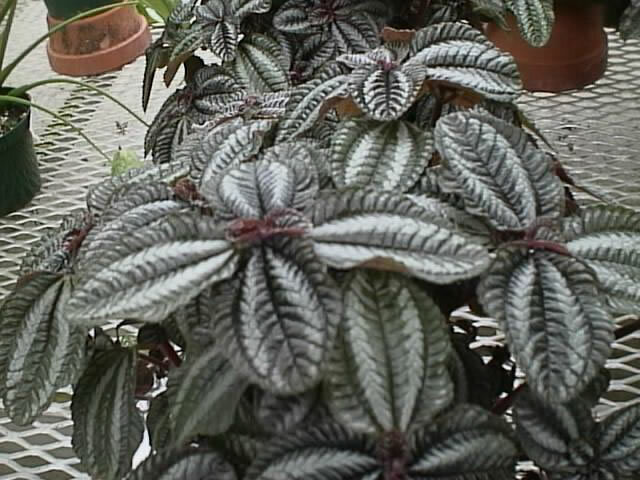 The fleshy leaves are accented with bold bands of metallic silver. 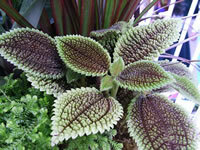 Good plants for growing in dish gardens or as specimen plants. Friendship Plants are native to Central and South America, where they are known as Panamiga plants. They are creeping plants that form dense, 8"-12" tall mounds of deeply textured, oval, 2½" leaves. The foliage color varies, but the most common variety has dark, reddish brown leaves gilded with silver or copper. The leaves have purplish undersides. 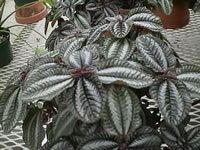 Moon Valley is cool little cultivar of the Friendship Plant, Pilea involucrata. It is a bushy, fast growing upright plant that grows to about 12" tall. Their greatest feature is their saw toothed edged, chartreuse leaves with deep texturing like the craters and valleys on the moon. (sometimes you have to use your imagination..) Excellent for terrariums or dish gardens. 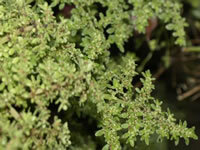 an umbrella like canopy of tiny, bright green leaves on fleshy, 6"-12" stems. pollen or seeds when the frond is touched. An excellent plant for terrarium environments. 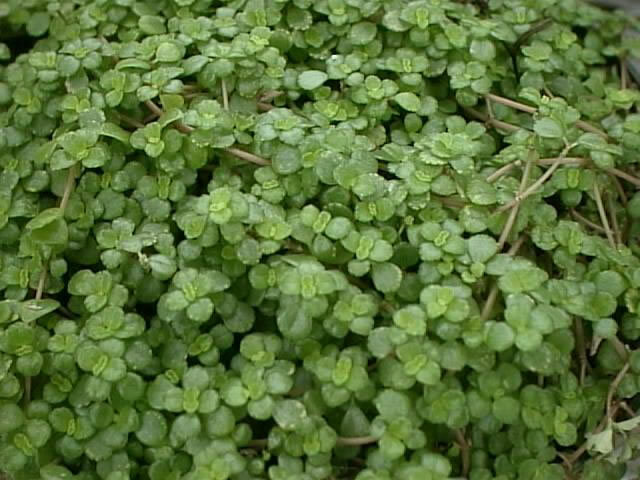 Miniature Peperomias are low growing, creeping plants with pairs of tiny, opposing round leaves on rigid stems that readily root at each node that contacts the soil. Unlike other Pileas, this ground cover plant prefers lower humidity and drier soil. 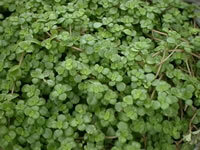 A nice, but fairly plain plant for hanging baskets or to cover the soil in large planters.